The canine ear is a sensitive part of a dog's body. It comprises the canine ear canal, cartilages and supply. Functionality of the ear is associated with hearing and balancing of body movement. Anatomically, the canine ear is a long circular tube which forms a canal deep into the head region, thus it is dark, moist and inaccessible. Normally, different microbes such as bacteria, fungus, parasites (mites, fleas etc) occur in this tubular canal, but once the immunity of the body is depressed or of a dog's ear is not cleaned regularly, these microbial populations can grow excessively. This will eventually cause common dog ear problems. Beside infectious, some non infectious problems in dog ears are tumors and hormonal imbalance. Canine Ear Infections; These are caused by bacteria or fungus. Symptomatically, both of these appear almost similar. Bacteria causes deeper lesions as compared to fungus. Fungus will affect the surface or margin of the ear canal vs. bacteria which damages tissues that are deeper in the ear. In fact, both types of infections usually occur simultaneously, and cause severe health problems in the affected dog. Both of these infections can turn into a generalized form of infection, which means that it can spread to other parts of the body. Canine Ear Parasites; Medically, the invasion of parasites is called an infestation. The most common form of dog ear infestation is caused by dog ear mites and fleas. These results in symptoms such as severe itchiness and discomfort. Problems may spread to other parts of the body, causing severe skin problems including itchiness and alopecia (hair loss). This type of ear problem can lead to secondary skin infections. Dog Ear Allergies; Different types of allergies such as food allergy, atopy (hypersensitive reaction to an allergen), dog flea bite allergy, allergic dermatitis etc can cause canine ear problems, which are characterized by itchiness, head shaking, swelling and redness and secondary infections if the condition is not attended to properly. 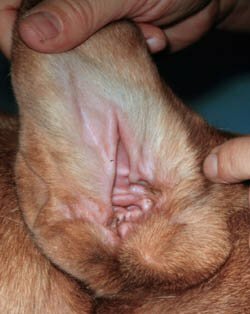 Hematomas; These are dog ear swellings over the outer flap of the ear, caused by accumulation of the fluids/blood in between the skin and ear cartilage. The cause of canine ear hematoma is mechanical, i.e. extensive head shaking related to some kind of underlying condition. Tumors and Hormonal Imbalance; Both of these are non infectious canine ear problems. Different tumors or cancers may affect the dog ear. Similarly, different endocrine diseases can lead to a hormonal imbalance, which affects the canine ear as well, along with other parts of the body. Pain, dog ear deformity and loss of functionality are some specific signs of these types of dog ear problems. As most of the canine ear remains hidden and inaccessible, dog owners should consult a veterinarian for a detailed examination using special equipment meant for clinical examination of the ear. This set of equipment is called an otoscope and the procedure is called an otoscopy. In recurring and incurable conditions, some laboratory procedures such as isolation, culturing and scrapping samples for examination under the microscope might be needed. Biochemical profiles and biopsy might be needed in cases where hormonal disturbances and tumors are suspected, respectively. In the case of a blockage and possible deformity of the inner parts of the ear, x-rays may help in confirming the cause of the problem. Canine ear problems should be diagnosed carefully. Sometimes even mild and minor conditions can turn into a severe health issue in its advanced stages. Dog owners must not treat conditions on their own. A veterinarian must be consulted for proper handling and treatment, as the inner parts of the canine ear are delicate and need careful handing. Antibiotics, antifungals, anti parasitic drugs are used for specific treatment of infectious and contagious conditions. All of these drugs require a prescription. The dosage should be adjusted according to the breed and age of the affected dog. Along with specific drugs, some steroids and symptomatic therapies can help when dealing with symptoms such as itchiness, pain, swelling etc. Symptoms such as discharges and lesions in the ear can be cured by dog ear cleaning with topical preparations and cleansers. Natural remedies such as Ear Dr. can help in treating mild conditions and can help to hasten recovery. A dog ear problem can be prevented if the ears are regularly cleaned, at least once in a week at home and through a thorough cleaning by a professional groomer once every 4 – 6 months. Moreover, if the ear problems are reported in their early stages, complications can be reduced, thus owners must regularly examine changes and developments in the ear. An easy way to make checking a routine is to do it with every bath. Regular use of natural remedies such as Immunity Liver Support can also help to keep the health status of the ear in peak condition.